HONG KONG (Reuters) - Start-ups specialising in alternative protein, from eggless eggs to pea-stuffed burgers and cell-grown fish products, are piling into the Chinese territory of Hong Kong to tap the mainland's booming multi-billion dollar food market. At a time when traditional meat farmers have seen profits hurt by the U.S.-China trade war and the spread of swine fever, companies such as Impossible Foods, JUST and Beyond Meat are luring affluent Asian consumers with products they say are more sustainable and environmentally friendly than conventional meat. The global meat substitutes market was estimated at $4.6 billion last year and is predicted to reach $6.4 billion by 2023, according to research firm Markets and Markets. Asia is the fastest growing region. Backed by some of the world's top billionaires including Hong Kong businessman Li Ka-shing, philanthropist Bill Gates and actor Leonardo DiCaprio, plant protein firms are expanding into China for the first time this year. San Francisco-based JUST, valued at $1 billion and which counts venture capitalist Peter Thiel’s Founders Fund as one of its backers, is planning to launch its mung bean faux egg product in up to six Chinese cities this year. "China is the most important market to JUST globally," said Cyrus Pan, JUST's China general manager. JUST has inked deals with Alibaba's Tmall and JD.com to distribute its egg product starting in Shanghai, Beijing, Tianjin, Guangzhou, Chengdu and Shenzhen, before expanding to other cities. The company says the use of mung bean as its key ingredient is important for food security and appeals to the Chinese market given its tradition as a dietary staple. China has a history of food safety scandals from melamine-tainted eggs, smuggled frozen meat years beyond its expiry date and recycled "gutter oil" to crops tainted with heavy metals. Nick Cooney, managing partner of Lever VC, a U.S.-Asian venture capital fund focused on alternative protein startups, said firms like his are eyeing joint ventures, exports and product technology licensing opportunities in China. "Chinese consumers seem to be more open to novel foods than those in nearly any other country," he said. Beyond Meat, which makes burgers and sausages from pea protein, has seen sales in Hong Kong increase 300 percent last year, said David Yeung, Beyond Meat's distributor in the special administrative region. Backed by Tyson, the world's largest meat processor, Beyond Meat filed for an initial public offering on the Nasdaq last November and plans to start distributing in the mainland in the second half of this year. 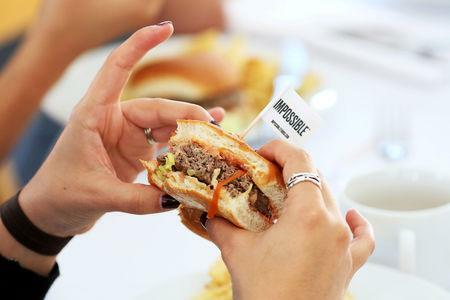 Rival Impossible Foods, which makes burgers out of soy, has said plant-based meat will eliminate the need for animals in the food chain and make the global food system sustainable. The group has received around $450 million in funding since 2011 with investments from Lee Ka-shing's Horizons Ventures and Google Ventures. Since launching in five restaurants in Hong Kong last April, the group's products are now in over 100 restaurants in Hong Kong and Macau. Hong Kong-based Avant Meats, which uses cell technology to replicate fish and seafood products, is developing a cell-based fish maw prototype due for launch in the third quarter of this year, its chief executive Carrie Chan told Reuters. Fish maw, or swim bladders, are popular in Asian soups and stews and are used to add collagen to food. Right Treat, another Hong Kong company headed by Yeung, is replicating Asia's favourite meat - pork - using mushrooms, peas and rice for use in dumplings and meatballs. The company has seen its sales of its Omnipork triple since launching in Hong Kong in April 2018. It has since expanded to Singapore, Macau and Taiwan, and plans to sell in mainland China this year. "If we want to change the world, we must find ways to shift Asian diet and consumption, which means we must find ways to reduce Asia’s dependence on pork and other meat products,” said Yeung, who also runs Green Monday, a startup tackling global food insecurity and climate change. Omnipork is available at more than 40 stores and will be stocked in major Hong Kong supermarket chains by the end of March, Yeung says. Advocates say meat substitutes are healthier and also use less water, produce fewer greenhouse gas emissions and use less land than producing the same amount of meat. Consumers, however, must be willing to pay a premium. Omnipork retails for HK$43 ($5.48) for 230g (8 ounces) versus HK$37 for the same amount of minced pork. Impossible's burger at HK$88 is more than double the price of a Shake Shack burger in Hong Kong. Yet the explosion of alternative protein products across Hong Kong has given consumers such as executive recruiter Shazz Sabnani, greater variety. "Before I had to rely more on vegetables and tofu-based products, whereas now I've introduced more of these fake meats to my diet." Still, not everyone is convinced about the fake meat trend. Tseung So, a retired 70-year-old said the spaghetti bolognaise made with omnipork at Green Monday's "Kind Kitchen" in Hong Kong, was not as tasty as real meat.